Cheese is generally served in France at the end of a meal, after the main course and before the dessert. This is the general rule, but of course there are variations. Cheese is sometimes presented at the same time as salad, after the main course. Often cheese is served with fruit alongside. If you’re pulling out all the stops for an elegant dinner, the order would be: starter, main course, salad, cheese, fruit, dessert, one after the other. The cheese may be presented on a platter, a wooden board or a plate. The question then becomes, how many types of cheese to serve, and which to choose? For the purposes of this post, I will mainly be mentioning French cheeses bearing the Appellation d’Origine Protégée, a label attesting that they come from a specific region and are made according to traditional methods. A total of 46 French cheeses have earned this distinction. You can take a look at them here. There are no hard and fast rules about how many cheeses to serve. It depends on the number of people around your table, and on the rest of the menu (you may want to serve more after a light meal, and vice versa). If I’m having a few friends over to dinner, I’ll generally present two or three cheeses. Or if I find an exceptional cheese, I may serve just the one. Once the number around the table surpasses six people, I’ll add a couple more cheeses and serve them on a platter. Sometimes I’ll serve half a cheese, presented prettily. As for selecting your cheeses, again there are no firm rules. What matters is the harmony of your assortment. You might choose three very different types of cheese — say, a hard cheese, a soft cheese and a goat cheese (chèvre). 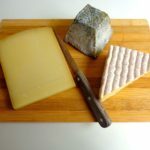 At right: Comté (from eastern France near the border with Switzerland), Pont l’Evêque (from Normandy), and Valençay (a cindered chèvre pyramid from the Berry in central France). You could also do variations on a theme. 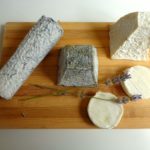 As I am partial to goat cheese, I might present an assortment of chèvres — for example, Sainte-Maure-de-Touraine (a cindered log from the Indre-et-Loire region), Valençay (the cindered pyramid) Pouligny-Saint-Pierre (another pyramid, from the Indre just to the south), and a couple of Rocamadours (a small flat cheese from the Périgord, still further south). By the way, coating cheeses with cinders (ash) is a traditional method of preservation, and the ash may be eaten along with the cheese. After a light meal, you could serve an assortment of rich cheeses. 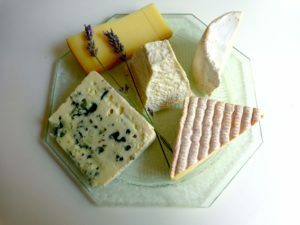 At right, Roquefort (made of ewe’s milk, in the Aveyron region of south central France), Chaource (made of raw or pasteurized cow’s milk, in the Aube region just north of Burgundy) and Pont l’Evêque (made of raw or pasteurized cow’s milk, and the oldest Norman cheese still in production). Or you might serve cheeses from the same region. At left, two cheeses from the rugged Auvergne region in south central France: Laguiole (from the Aveyron) and Fourme d’Ambert (from throughout the Auvergne), both made of raw (unpasteurized) cow’s milk. With all French cheeses, it is fine to eat the rind, although this is less traditional with hard cheeses like Laguiole. When choosing your cheeses, it’s worth paying attention to the season. Take Mont d’Or, for example. It’s a pungent, soft cheese from the mountains of eastern France that is served straight out of its box — with a spoon! The rules governing its production mandate that it be produced only from August to March, which is why this cheese is best served in winter. Salers is produced only from April to November, making it a fine cheese for autumn (it marries well with grapes). And the best time of year for goat cheese is spring. But suppose you’re not in France? No problem. One can easily assemble a fine cheese plate pretty much anywhere in the world. Of course you can buy imported cheese, but there’s also much to be said for discovering local artisanal varieties. In the States, I might combine a hard, aged Cheddar with Monterey Jack (preferably Dry Jack) and cream cheese to which I’ve added some crushed garlic and snipped chives. 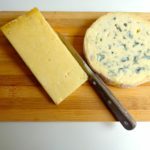 My British friends have taken great pleasure in introducing me to some of their local favorites, like Burwash Rose and Caerphilly, to which I’d add Stilton (one of my favorites). Now, about serving the cheese. Before taking the cheese to the table, remove any labels and wrappings. Logs of goat cheese come with an aeration straw that must be pulled out. Place a sharp knife on the platter and make sure the bread basket is full (just bread, no crackers). Each guest will serve herself or himself in turn. But how to cut the cheese? 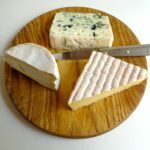 The general rule is that the smaller round and square cheeses, like Camembert, Pont l’Evêque or a goat cheese pyramid, are cut in triangular wedges from the center, as though you were serving a pie. Hard cheeses that arrive in a block, like Comté, can be sliced crosswise. But this is not the case with cheeses like Laguiole, Roquefort or Brie that arrive in a wedge. They should be sliced from the outer edge to the tip (it’s considered poor form to slice off the tasty tip for oneself). There is so much lore associated with cheese in this country, and opinions can diverge so sharply, that some readers may wish to take issue with some of the above. Please do! I do not claim expertise on the matter. So much of it is a question of individual taste. The main thing is to offer your guests a convivial moment of sharing the cheese — accompanied, of course, by an appropriate wine. But which wine to choose? Usually red, but here, too, opinions diverge. I find that a crisp Loire white like Sancerre or Menetou-Salon is fantastic with goat cheese. But this is a vast subject, which will have to wait for another post.